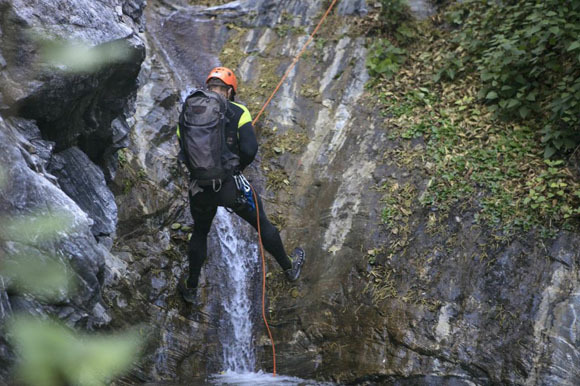 Test your limits this summer and try something new: canyoneering. 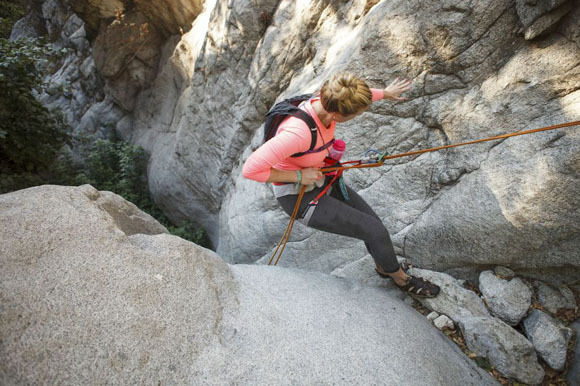 It’s the sport of exploring a canyon by rappelling, down climbing, and waterfall jumping—but don’t worry, it’s not as hard (or as scary) as it sounds thanks to these tips from photographer Kat Carney. Word of advice: take a class or hire a guide if it’s your first time out—safety first! You need more than gear to descend a canyon! Required skills include rappelling, anchor setting, and knowledge of the canyon rating system. Learn from someone who knows what they are doing. I went to a meet-up group with a certified instructor leading a course before I started descending canyons. We learned about using our rappel devices, how to assist fellow canyoneers with a fireman’s belay, and information about the knots and gear needed to set anchors. There are many ways to rappel, and different variations depending on the length of your rope in relation to the length of the rappel. Don’t forget you need to retrieve your rope to continue moving down canyon. Make sure you know how to set a carabiner block and attach a pull cord before dropping in. A comprehensive guide of the canyon rating system can be found here. This is important to know so you don’t go into a canyon unprepared. A canyon rating looks like this: 3A IV. The first number is the general difficulty rating. 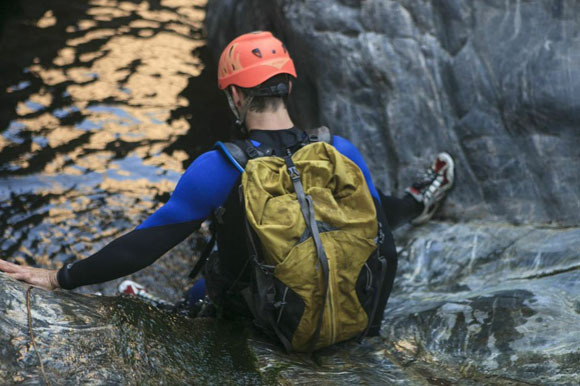 In this case, “3” means intermediate canyoneering, meaning you need technical gear to descend the canyon. The number is followed by a letter. “A” means the canyon is mostly dry. And the Roman numeral at the end indicates the length of time it takes to get through the canyon. “IV” means you “are expected to have a long day. Get up early, bring a headlamp. Possible bivy,” according to Canyoneering USA. Canyons require a certain amount of technical skill and knowledge, and once you lock down these abilities it opens a new outdoor world to explore. Utah is known to have some of the worlds best and most unique slot canyons, but Southern California has plenty to offer, too. Here are some of my favorite canyons in the SoCal region. Eaton Canyon (3B/C IV)- Eaton is my favorite southern California Canyon to date. There are waterfalls, jumps, waterslides, and a lot of picturesque scenery. It is easily a 12-hour canyon with a fairly long approach and around 9 rappels. The canyon walls are high, beautifully carved, and the closed thing I’ve seen to a slot canyon in SoCal. We did it in the winter and you MUST have a wetsuit. Unfortunately, it is a short hike to the last two waterfalls from a popular hiking trail and the bottom of the canyon is full of graffiti and curious onlookers yelling things and cheering when you descend the last rap. Fantastic Mr. Fox (3A IV)- I was fortunate enough to be part of a team that did the first descent of this canyon. It is located in the Big Tujunga Region of the San Gabriel Mountains just north of L.A. It makes for a long day, taking between 10 and 12 hours to complete while gaining 2900 feet on the approach with the total mileage checking in at just less than 8 miles. I love this area because we didn’t see a single person the entire day. With such close proximity to L.A., that is a monumental feat. There are 6 rappels the highest of which is 185 ft. The canyon has a real backcountry feel, probably because we were the first people ever down it! No wetsuit necessary. Little Santa Anita (3C III)- This canyon was not flowing heavily when I did it in the fall, but the incredible beauty of the narrow granite walls made it memorable and it is back on my list for this spring. Listed as 6 hours and 4 miles this canyon is just right for a leisurely day. The whole canyon is bolted so setting anchors is a breeze and leaves more time to enjoy the incredible views. I didn’t use my wetsuit, but it is advised to bring one in the spring. 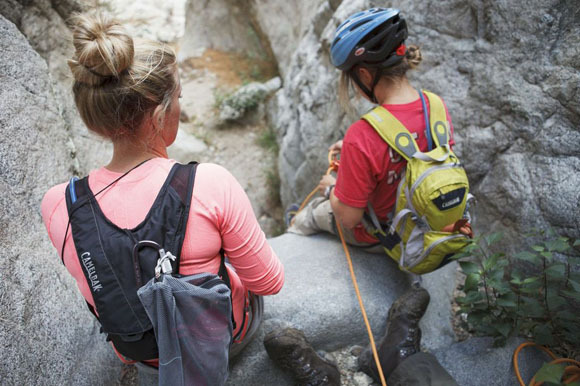 Extra Credit- I haven’t done it yet but I really want to do Jump Canyon-(4CR IV) in Kings Canyon National Park. There are over 45 waterfalls requiring rappels (up to 150′), jumps (up to 30′), and many slides and down climbs. AWESOME!